Anyone following the successful career of Omaha visual artist and musician Bill Hoover might accurately conclude his life is like an open book. His public and private life often merge on stage and canvas in a manner befitting his roles as creative partner, teacher, singer-songwriter and painter. This engaging artist remains a popular figure as pivotal events in his life have played out in paintings and songs “deeply rooted in folk storytelling,” Hoover said in 2008. It was then, in his first solo art show at the former Pulp Gallery in Benson, his work became more personal and expressionistic after a key transition in his private life. Though this breakout show was still indirectly biographical, you could say Hoover was wearing his heart on his sleeve. Two years later his second solo show, Paintings from the Vision Inhabited House , at the very sophisticated and urban chic space in the Stone House Art Gallery, exhibits a more mature, introspective body of work that, largely, is unmistakably Hoover. There are still occasional signs of the familiar artist in this show via his signature rich color palette, flat, two-dimensional surfaces and perspective, and cubist and Basquiat-like figures that range from the naive to the surreal. Yet, this exhibit is dominated by an aesthetic that only began to emerge two years ago. In short, by way of comparison, Vision Inhabited House is more spare, minimal and conceptual rather than figurative, exotic or narrative. Hoover is still painting about himself, family and relationships as he continues to be character and creator; but over time, the tone’s moved from the sensual to the emotional and lately, the meditative or contemplative. All three tones persist in his admitted “mood swings,” but the scenario is less overt, and moments of quiet beauty are mixed in here with darker passages. The artist establishes this paradox early with the show’s signature work, “The Master Narrative,” just as he did with the telltale painting in his Pulp show, “The Rooms I’ve Walked Into.” Unlike the latter, a more overt and emotional look back and cry for understanding, the former is a study or establishing shot of one who has moved on, still in pursuit of his dreams, still possessed by a few demons. In this large masterly work, we see three of Hoover’s favorite visual motifs, chairs, birds and houses, which is the title of a Miro-influenced work from his 2008 show. Except now, instead of the abstract scratchings of the earlier work, he’s merged all three motifs into one iconic figure in “The Master Narrative” which he says he magically discovered lurking in the corner of the first drawing. Part bird, chair and house, and all black, this tripartite logo, a symbol Hoover says stands for himself, stands on a road facing an equally dark house further down. Completing this seemingly serene yet ominous scene is a background of rows of undulating houses on their hilltop setting, and the foreground, a withered garden gone to seed. Overall the paintings suggest a theme common to Hoover’s work, a journey or quest with the artist in pursuit, no doubt spiritually as well as materially. The difference being, as with much of the show, that meanings are more implicit and often couched in his curious iconography. “I used to be clearer on my goals and point of view as well as the narrative,” Hoover says, particularly of his first solo show. 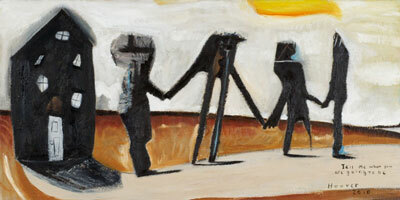 “Now it’s more about the mood and the questions raised within the work.” Hoover’s clearly left that “hiding place” he spoke of in 2008; most of this current work is outside or “on the road.” Yet his curious, dark logo and similarly abstract figures persist along with an uncharacteristic palette of black, white and beige. The overall effect with some notably cheery exceptions is a sort of “art noir” of mixed emotions and contradictions. Key examples include the minimalist set pieces of “The Tin Soldier” and “Tell Me What You Are Going to Be.” In the former, two lone iconic figures square off against each other on the plain. The impact in this spare scenario is less confrontational and more confessional, as if each were looking into a mirror at their doppelganger, one part hero, the other part Tin Man. Perhaps Hoover’s put the Scarecrow to rest and is on a more philosophical quest of identity and creativity. His two self portraits reflect that same sort of puzzle, but no more so than the stark narrative of “Tell Me What You Are Going to Be,” which may be the most impressive and evocative work in the show. In it, three dark ciphers have left the comfort zone of their dark house, led by a fourth figure standing erect on the road and looking into a sun-filled horizon as it stretches beyond the frame. Is this a Don Quixote dream or a dance macabre nightmare? Hoover is still looking for his bliss somewhere in between. To complement the grittier landscape and direction of this new work, the artist has devised a method of mixing, throwing really, sand into the oil and charcoal, his mediums of choice throughout. The process lends itself well to the edgier, more surreal mark-making prevalent in the show. Not that Hoover has completely abandoned his colorful, expressionistic narratives as in “J. Calls Me Late at Night.” And for good measure he has included a series of seasonal “garden” paintings to lighten up a bit, connect with nature and demonstrate that his life does occasionally enjoy a balance. “These paintings are telling me who I am,” Hoover says, and in the aggregate suggest an artist becoming more complex moving forward. Paintings from the Vision Inhabited House is on view Saturdays only from 4-8 p.m. or by appointment through Nov. 20, at Stone House Art Gallery at 1508 Leavenworth. Call 934.2947. Bemis Auction Results Are In …Openings galore!